February | 2014 | Hand Luggage. Wat Phra Singh (full name Wat Phra Singh Woramahaviharn) is located in the western part of the old city centre of Chiang Mai, which is contained within the city walls and moat. 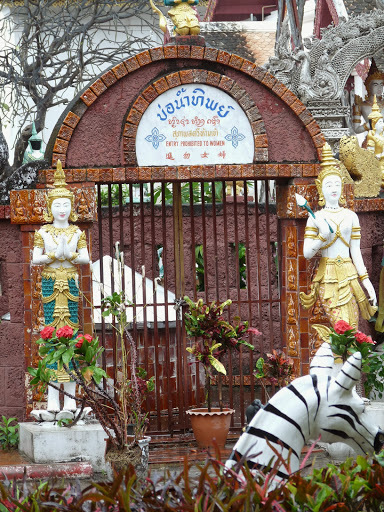 The main entrance, which is guarded by Singhs (lions), is situated at the end of the main street (Rachadamnoen road) of Chiang Mai. 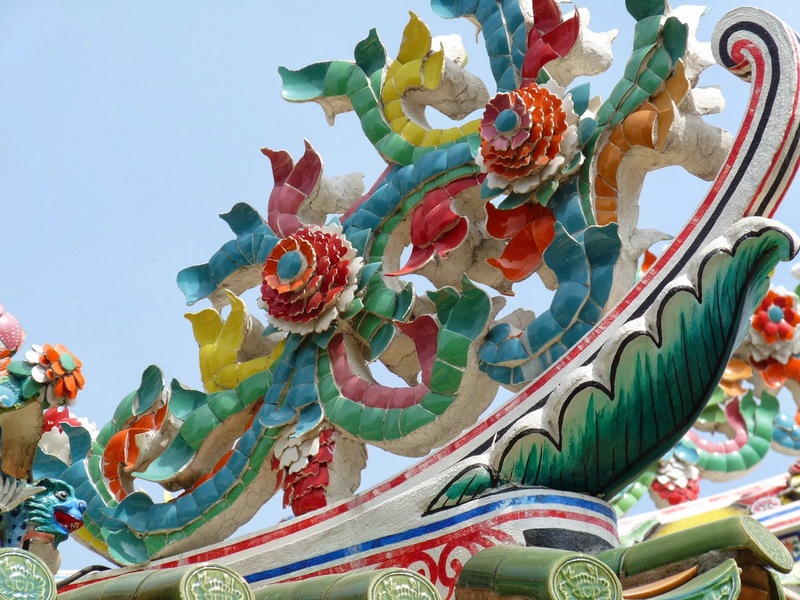 The road runs east from the temple, via Tapae Gate, to the Ping River. 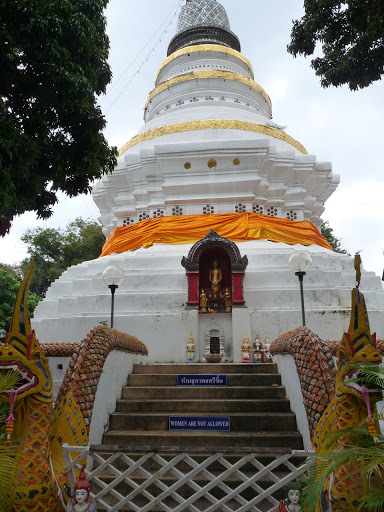 Construction on Wat Phra Singh began in 1345 when King Phayu, the fifth king of the Mangrai dynasty, had a chedi built to house the ashes of his father King Kham Fu. There are many different buildings within the temple complex. There’s Ho Trai the temple scripture library, where ancient Buddhist writings are kept and Wihan Lai Kham with it’s impressive murals. 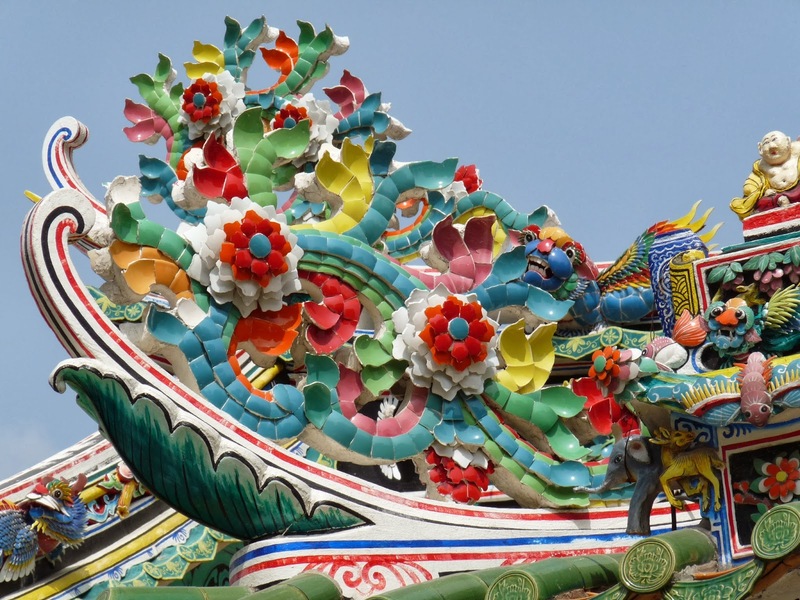 Ornate Nagas slither over the temple while gilded decoration and jewel bright colours cover every inch. Here’s some details of the beautiful artwork and window detailing. Next temple on the snap happy tour was Wat Boopparam / Wat Buppharam. A zany, colourful affair close to the southern side of Thapae Road. Not quite sure how Donald Duck fits in with Buddhist teachings, but he is there! Along with a veritable menagerie of animals including a camel and other mythical guardian animals. Colourful Naga guard the temple. We got caught in a torrential downpour and ended up spending over an hour in the small museum and library room of this particular temple! There is a Sacred Source in the temple grounds that used to be full of holy water – it’s nearly dried up now and surrounded by a wall. 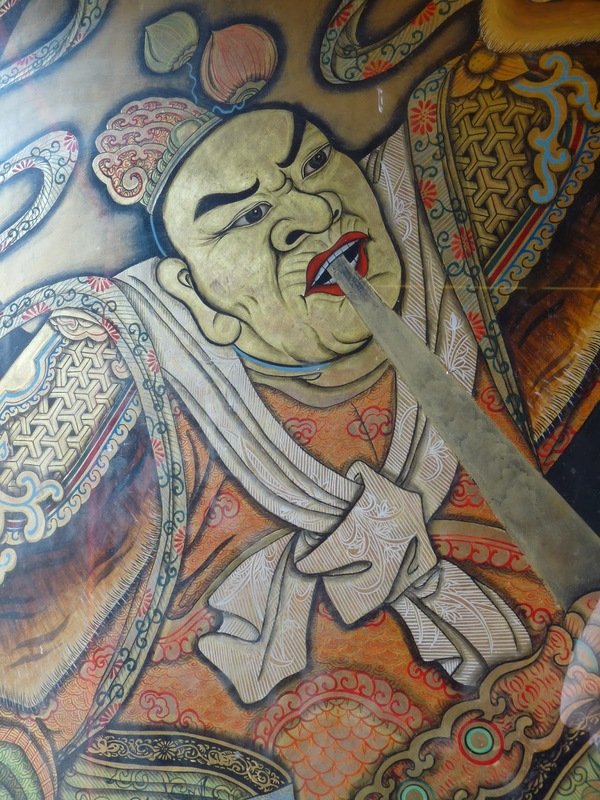 The water served in the past to wash the Buddha relics. 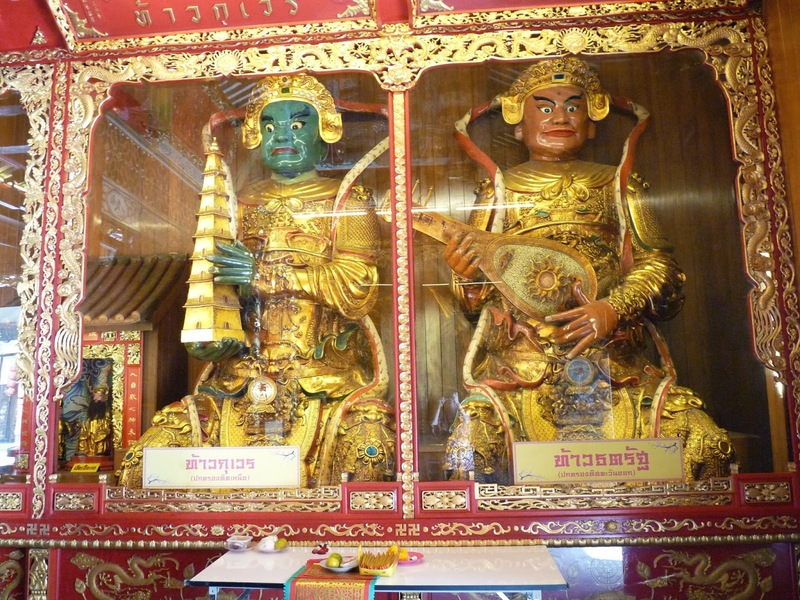 It was also used for the baths of the kings of Chiang Mai. The upper prayer hall is reached by stairs guarded by mythical beasts. 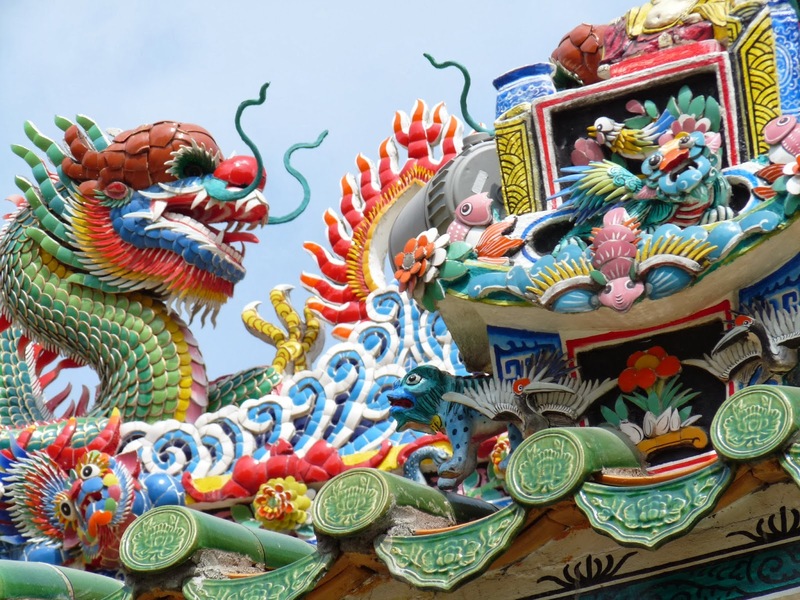 Part dragon and part snake, similar to the Makara of Hindu mythology.The Makara is a terrestrial animal at the front and aquatic animal at the rear sometimes a fish tail or a seal. The Great “Dhamma-hall” of Wat Buppharam. In front is a large walking Buddha statue. 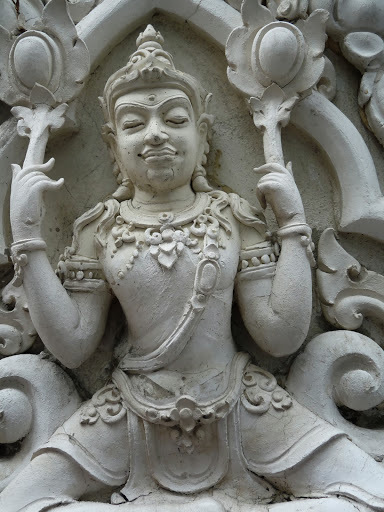 More of the sacred Nagas – snake-like beings or a snake deity – guard the temple. They curl around stairs, slither up walls and coil around pillars where ever you look. A bit of potted history for you now folks! In the late 1800S, King Chulalongkorn made a deal with British tradesmen allowing them access to the Siam kingdom’s huge teak and rosewood forests. He also allowed them to live in Chiang Mai. However there was one condition – that they lived on the east side of the Ping River, away from the locals and the ancient city ruins. 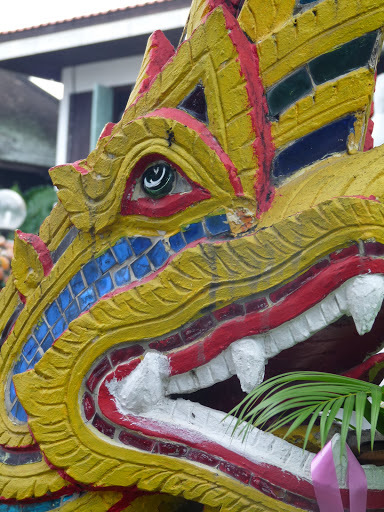 The area they settled in is known as Wat Gate, a graceful area with elegant teak houses. Our lovely Sakorn Residence hotel was situated in this area. Now, along with markets and taking thousands of pictures of anything I stumble across, my other great passions is temple bagging! 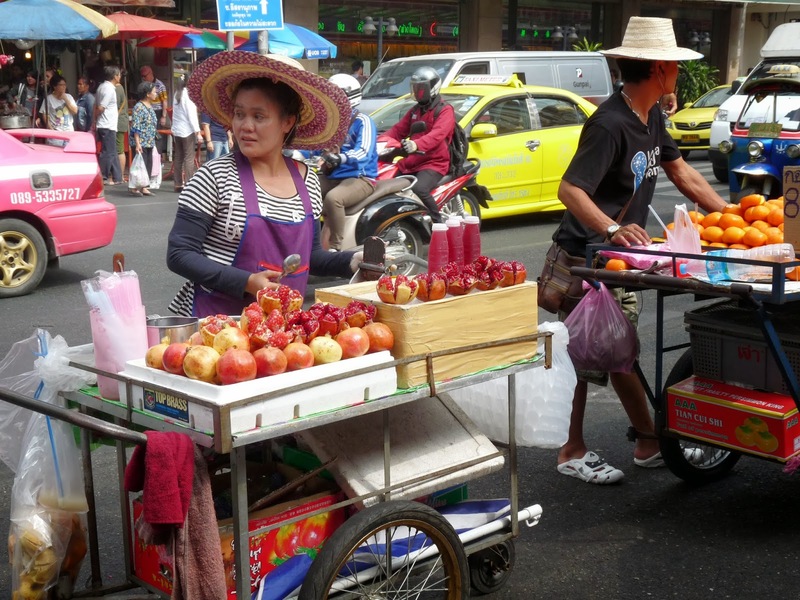 And Chiang Mai is a veritable cornucopia of them. 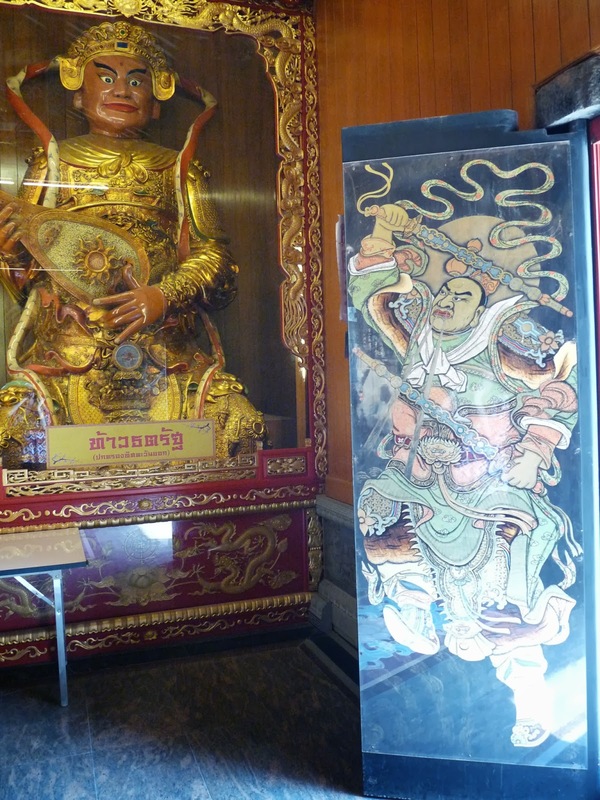 One of the first (and closest) temple we visited was Wat Gate Karam and its museum on the east bank of the Ping River. This is the temple that gave the area its name. 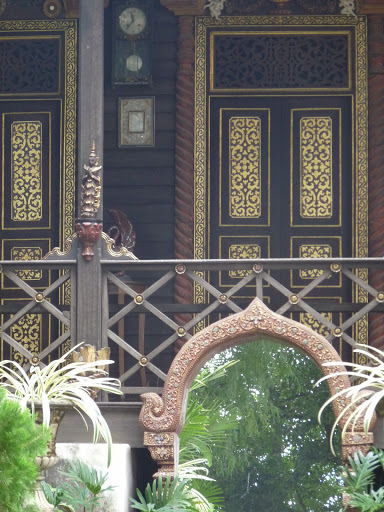 Above is an example of one of the lovely teak houses in the Wat Gate style. Gorgeous ornate doors at Wat Gate’s ornate prayer hall whose exterior walls are richly adorned with gilded apsara dancers and dragon friezes. 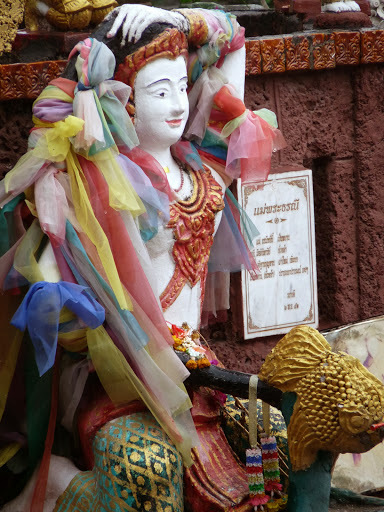 After waving goodbye to frantic Bangkok we hopped on a plane north to the cooler climate of Chiang Mai. 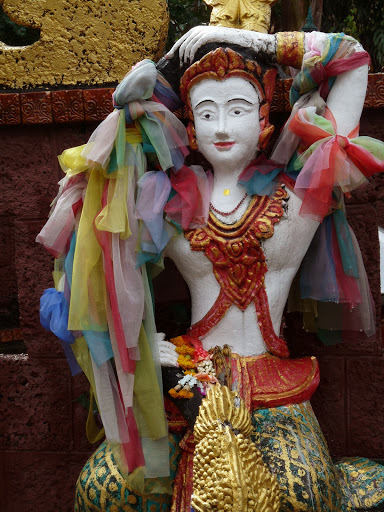 A city full of temples and the best markets in Thailand . . .woo hoo!! We stayed in the fantastic Sakorn Residence. 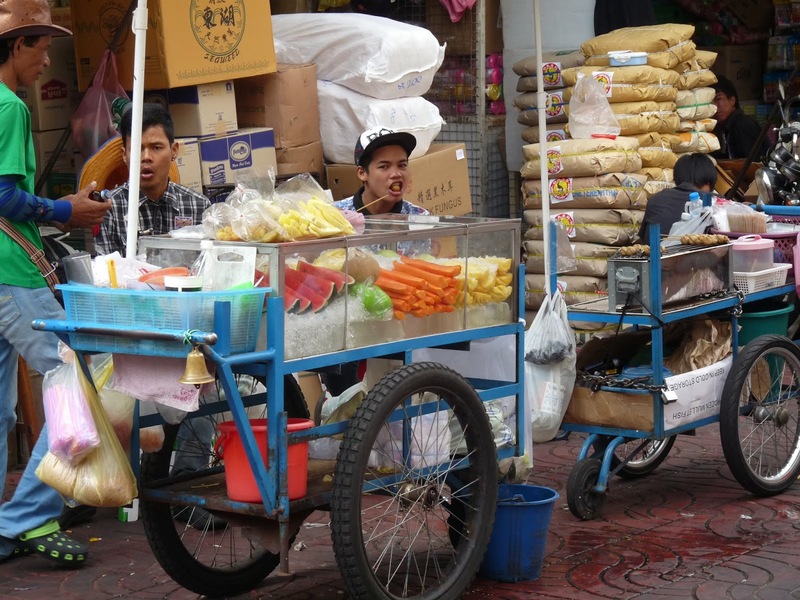 Set out of the centre of town, about 20 minutes walk from the markets and Tha Pae gate. Large, beautiful but simple rooms over look a nice pool area and the staff are adorable!! Here a market trader cuts sugar cane at Tha Pae Gate in readiness for shoppers with sweet cravings. There are several different markets to try. 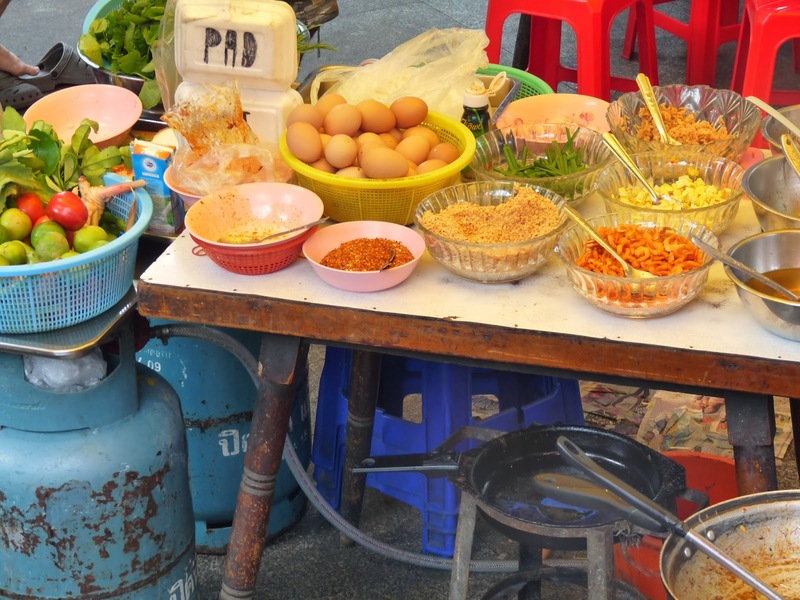 The main ones are the Saturday market, the Sunday walking market and the night market. Plus there’s the less touristy places such as Worarot Market, the main local market. 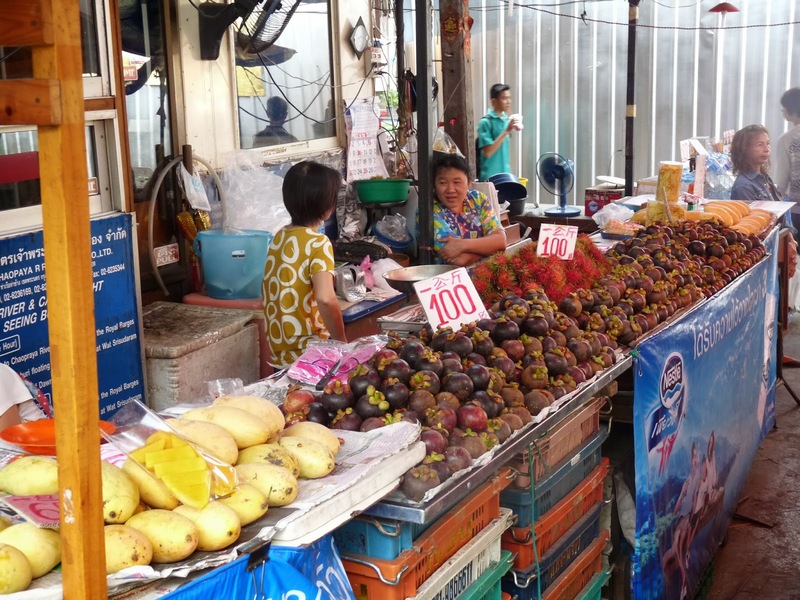 The huge, sprawling Sunday walking market on Th Ratchadamnoen is an immense, crazy sight with hundreds of stalls selling everything from snacks to clothes, wooden carvings to a rainbow of textiles. It is a great showcase for local arts and crafts. 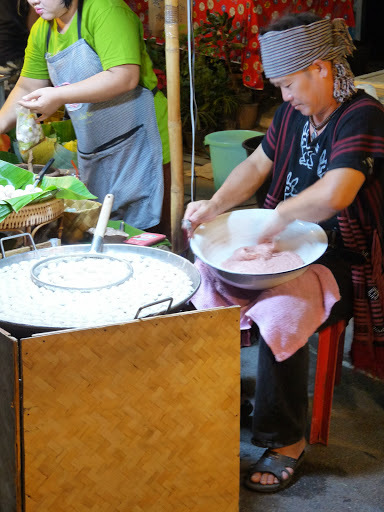 Many stalls sell the vibrant, beautiful textiles and crafts of the tribes who live in the hills outside of Chiang Mai. There are six main groups of hill tribe people — the Akha, Lahu, Karen, Hmong (or Miao), Mien (or Yao) and Lisu living in Northern Thailand. Carved soaps are another colourful gem of a souvenir. Fragrant and delicate. I wanted to lick them . . .
A psychedelic splash of colour on every street corner makes you need one of absolutely everything in every shade!! The markets are a hive of activity but without the constant, never ending efforts of a legion of workers, nothing would be done. From skinning to cleaning, steaming, frying and cooking anything that grows, crawls, slithers, walks or flops about, this army of stall holders work from dawn till dusk. 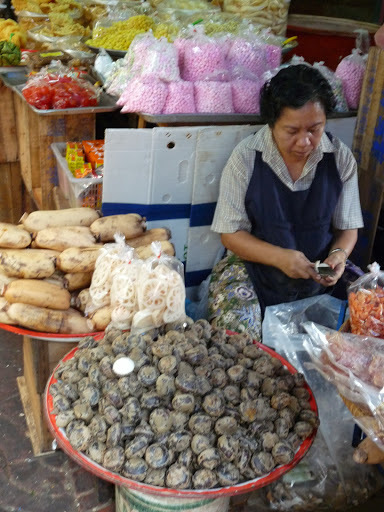 Even more market pictures capture the endless hub of activity in the tiny side streets. Colourful sweets are bagged up and ready for the hordes of children. I think these are sweet rice balls – traditional Chinese dessert eaten to celebrate the beginning of winter. 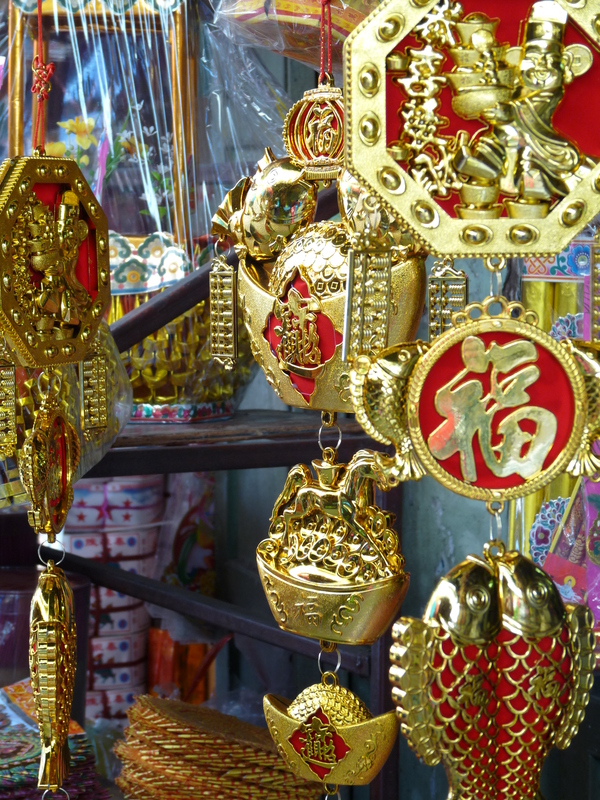 Golden and red good luck artifacts glimmer in the intense sunshine of a Chinatown side street. 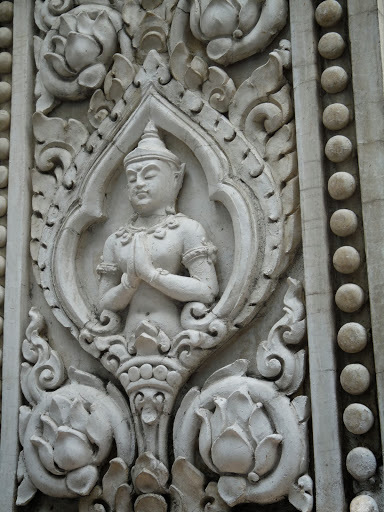 Detailed ornate stone work can be seen around every corner. Hard work moving anything in these hot, dirty streets. There are pulses, grains and nuts of all shape, sizes and colours. Piled high, in plastic buckets, in bags, in barrels. Below are just a selection of the types on offer, at a guess there are yellow peas, soya beans, black gram beans, adzuki, lima and more. Bags of dried mushrooms are at least one of the more identifiable items to buy. This variety are Shiitake mushrooms. 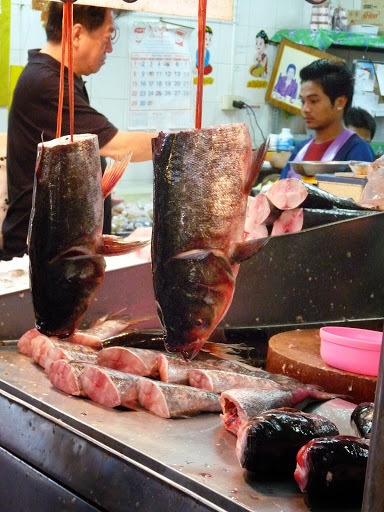 Dried fishy delicacies are laid out with precision. Dried shrimps are laid out in seemingly endless piles. 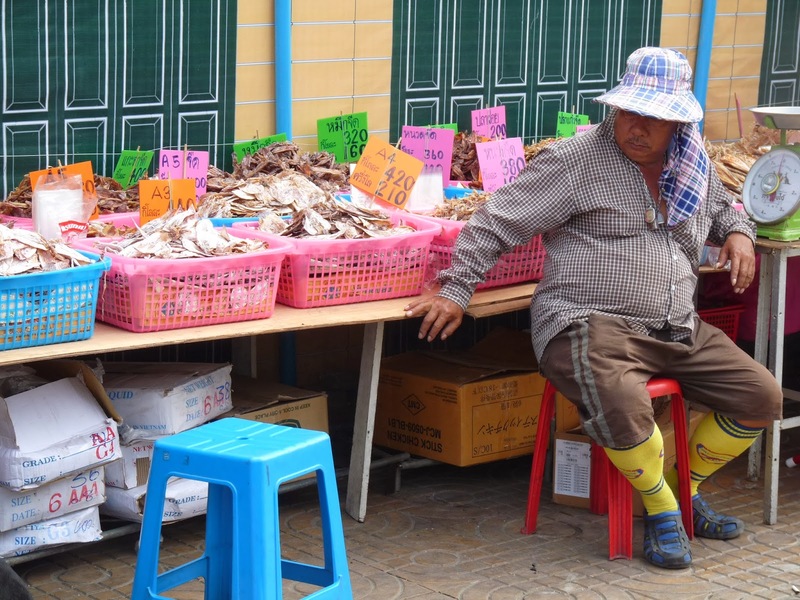 The small shrimps are dried under the sun for many days since they are so small that most Chinese tend not to cook them fresh, therefore the fisherman will dried them and packed them for selling. 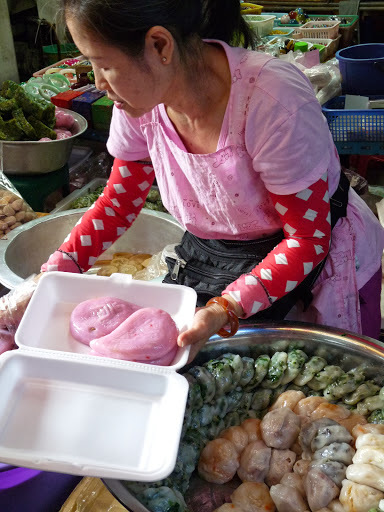 Shrimp are usually cooked in soups, Chinese steamed cakes, stir fried with dishes and baked as side dishes. Bits of chicken wait for hungry housewives to claim them while pulses, seeds and nuts wait to be transformed. 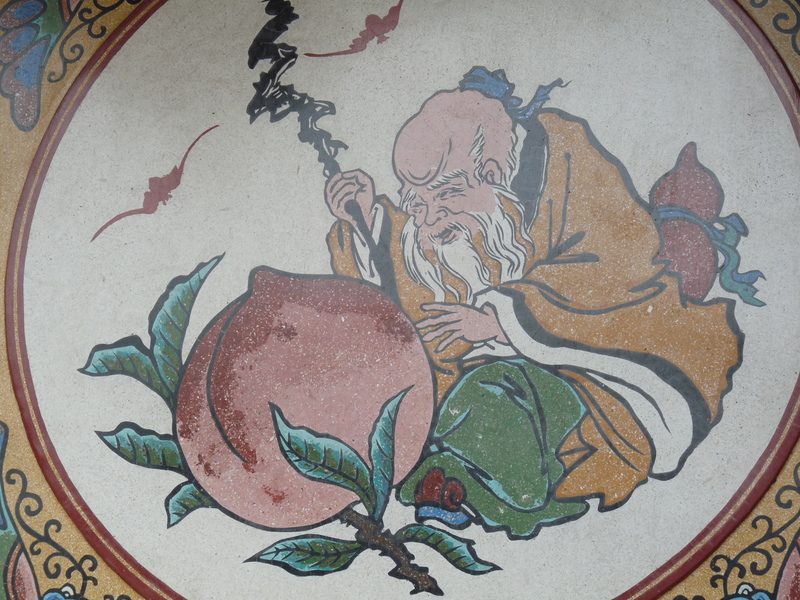 A lot of Chinese art is deeply symbolic with particular motifs cropping up time and time again – for example the gnarled tree above, which may represent the unconquerable spirit of old age. Beautifully portrayed inanimate subjects like landscapes such as above, are also rich in symbolism, not just there as pretty background: the rocks and streams are alive, showing the invisible forces of the world. Landscapes are also often painted to achieve a harmony, with the delicate balanced portrayal of rocks and water or mountains and sky. 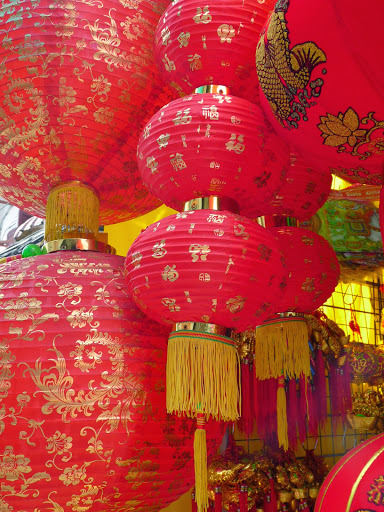 Certain themes and arrangements carry special meanings which often help with Feng Shui. Bamboo suggests the spirit which can be bent but never broken and jade represents purity and indestructibility. 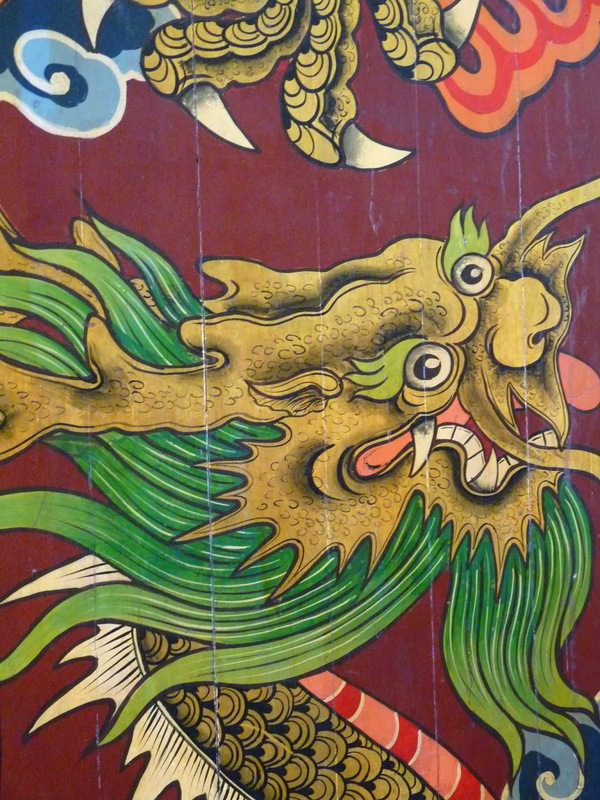 The mighty dragon that appears everywhere, crawling across every surface can been seen as the symbol of the emperor and the crane symbolises long life. Vivid colours splash across every surface in a riot of rainbow joys!!!!! Lots of images are drawn from the plant world such as the orchid – a Confucian symbol of purity and loyalty. The winter plum, which flowers even in the depth of winter and stands for renewal, endurance through hardship, and hope that life will begin anew. Paired mandarin ducks mean faithfulness in marriage and the colour red is used everywhere as it ties into the element of fire and symbolises luck, joy and good fortune. 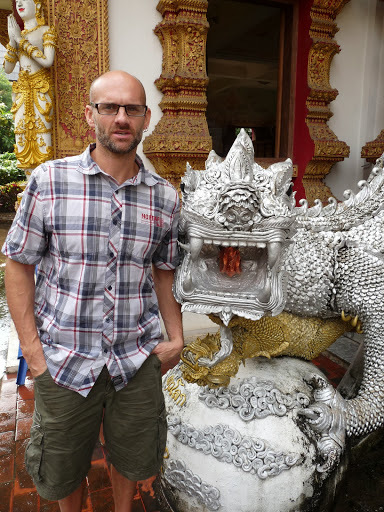 One of the things on my to do list when I returned to Bangkok was to roam through one of the charming amulet markets. 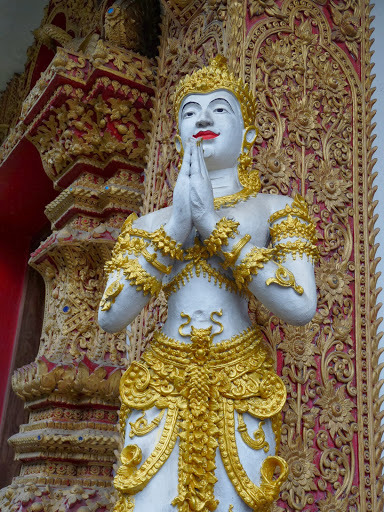 I got the chance during our river cruise day when we disembarked close to Wat Pho. 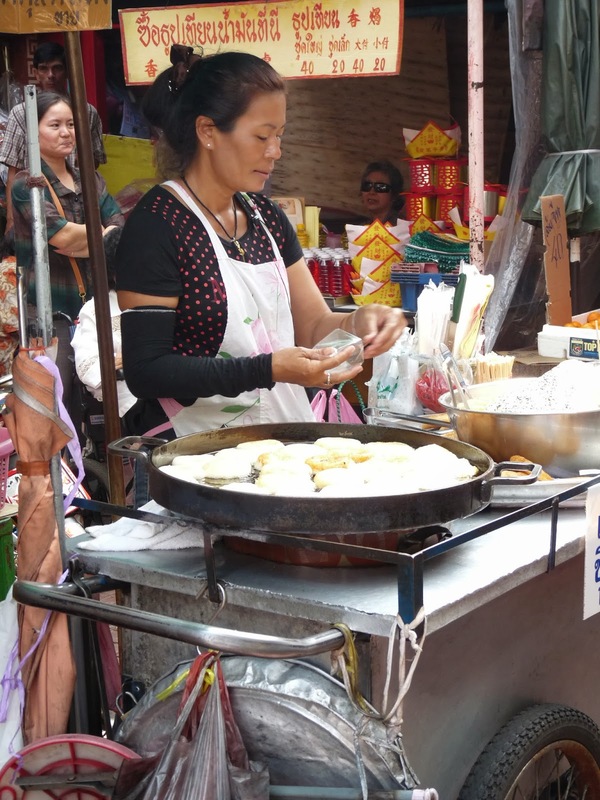 A long tree lined street with lots of sellers, mainly sat cross legged on the ground with mounds upon mounds of little carved protection charms in front of them. As well as the dizzying choice of dinky amulets you can also buy tiny frames and plastic cases to protect your chosen trinket. There’s bronze ones, silver ones, oh so shiny thin gold ones, stamped ones, carved ones, vividly coloured imaged ones and so much more! As well as metal ones of all shapes and sizes there’s carved stones too. Some of the amulets are very rare and sort after and can exchange hands for a lot of money. You’ll see lots of old men, sitting, magnifying glass in hand, poring over hundreds of the tiny things, checking the authenticity of them. 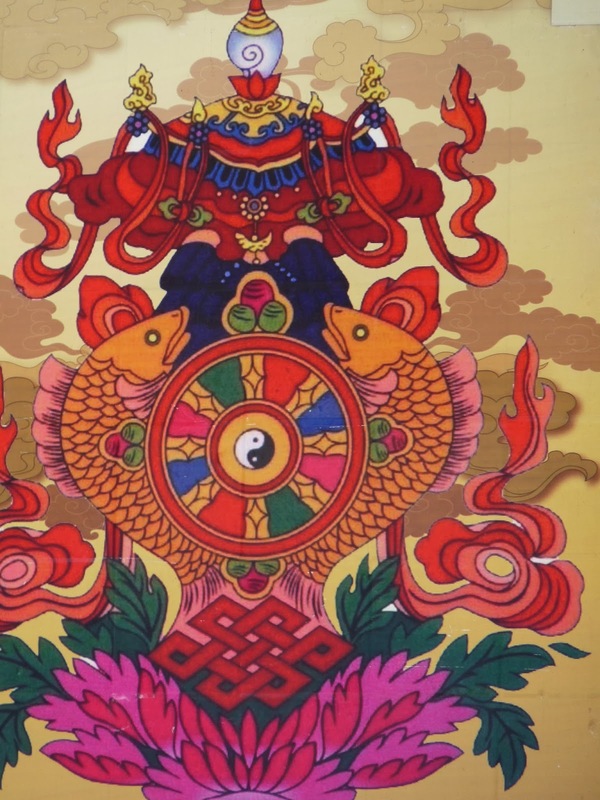 The amulets are made by monks and are thought to offer protection, whether in business transactions, health, wealth or whatever it is you are hoping for. Here’s one of the vendors taking a snack break. After doing my own prolonged poring over items I eventually bought 10 cute little amulets to take home and attach to a charm bracelet. Fingers crossed they give me some protection! 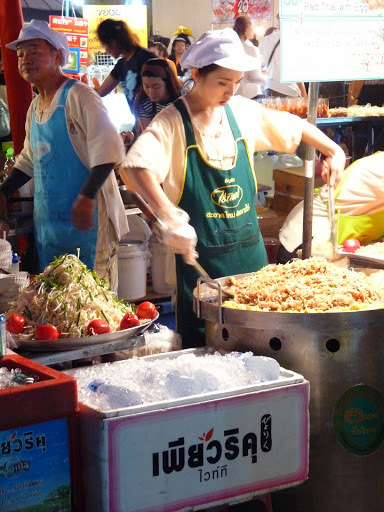 Bangkok street food and nibble vendors! 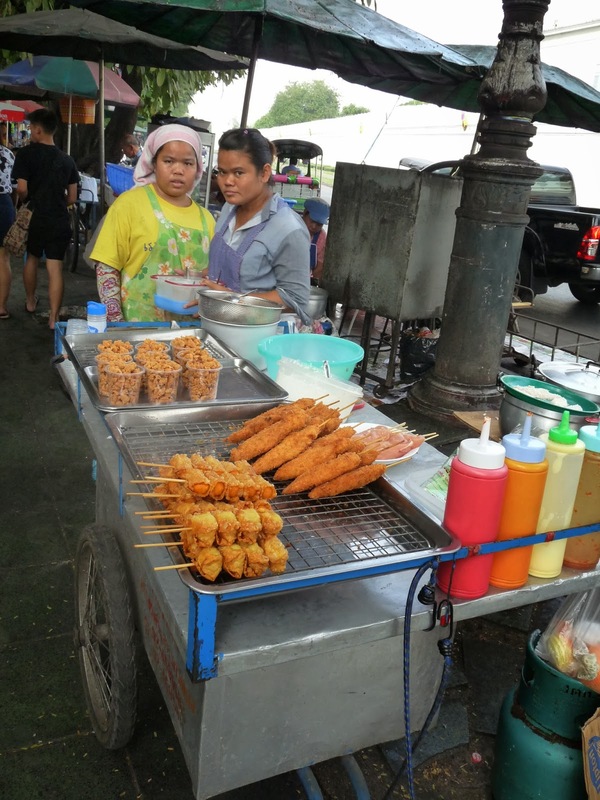 One of the commonest sights in Bangkok, apart from the endless massage shops, are the proliferation of street food sellers. 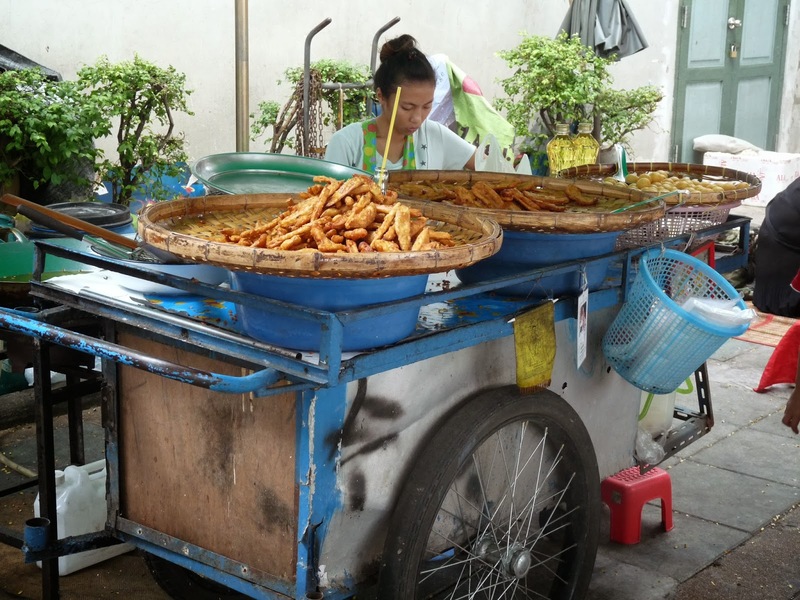 On every street in long, steaming, fragrant lines, hidden beneath underpasses, knocking on your car window, running up to your tuc tuc, squeezed into every conceivable nook and cranny you will find them. 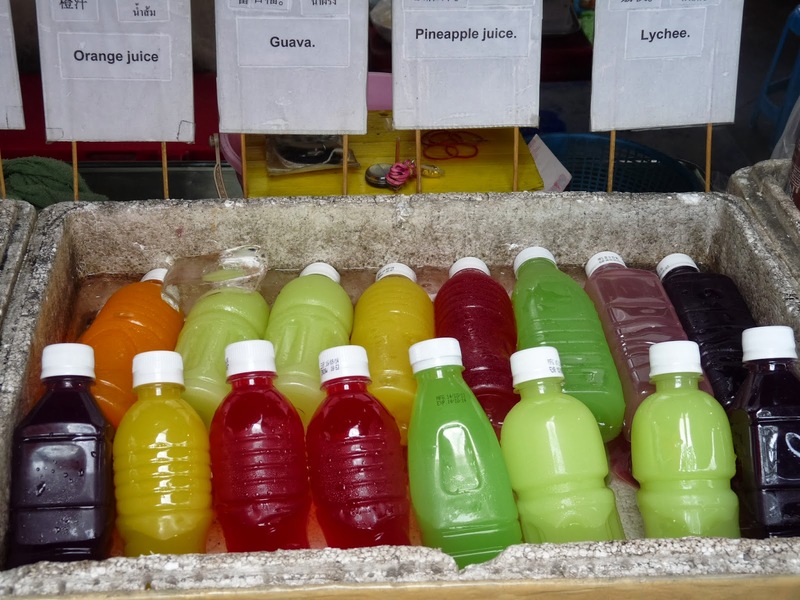 Whether it is selling fresh fruit juices of every colour and flavour to oddly shaped meat items of dubious origins. Wherever you look there will be someone selling something! 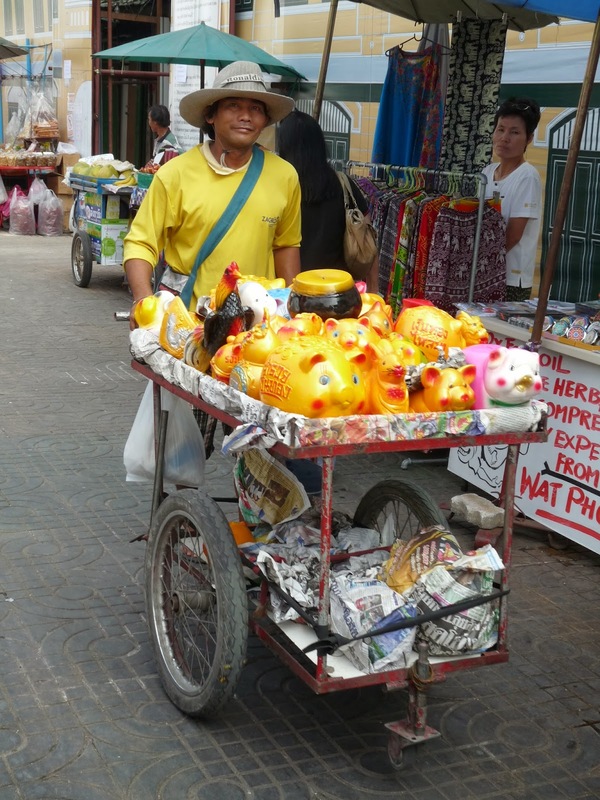 Here’s a man with lucky piggy banks, I know you can’t eat them but his smiley face deserves inclusion! 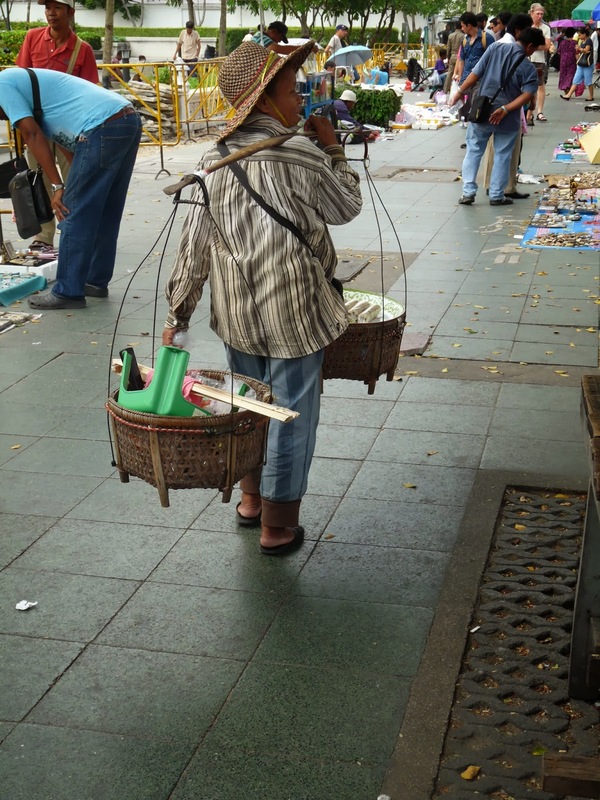 A traditional method of carrying your wares is demonstrated by this seller working the amulet market close to Wat Pho. Suspicious faces mirror my thoughts on what they are selling. . . .
Pad Thai, the traditional, iconic dish of the nation is advertised on this make shift stall. 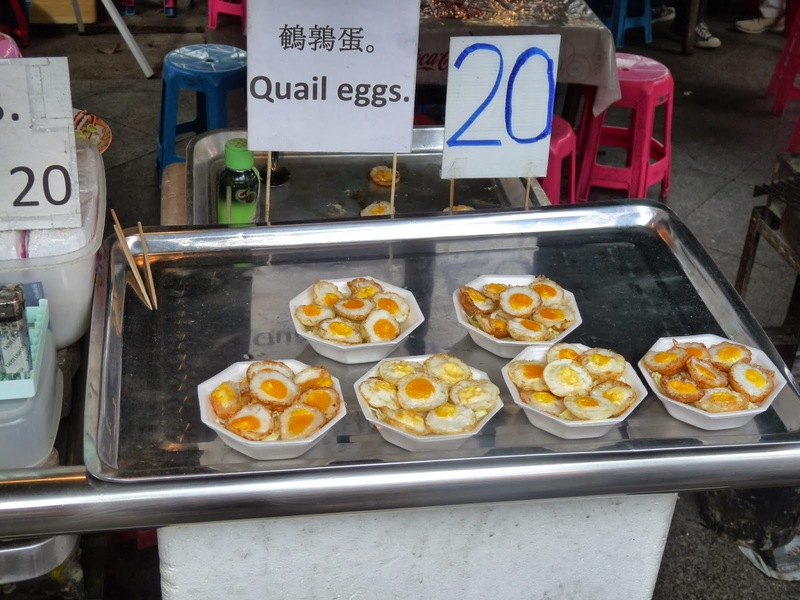 Tiny boiled quail eggs make a mini mouthful while jewel bright juices tempt a thirsty, hot tourist. 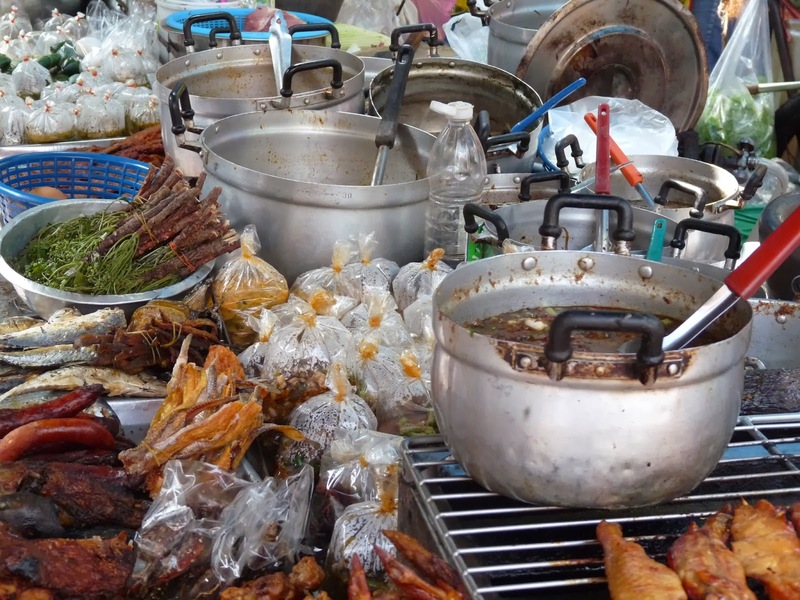 You will never go hungry in Thailand, and with mere pocket change you can eat like a king! 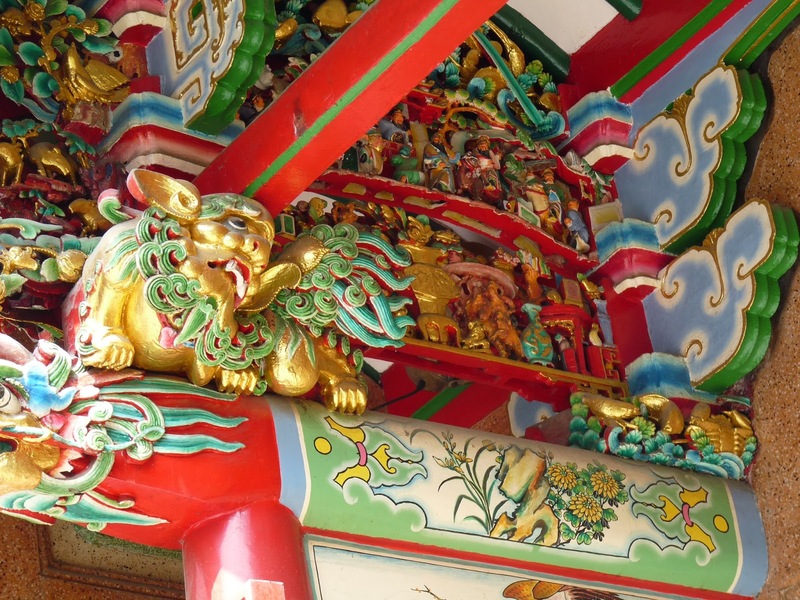 As you mosey around the tiny hidden back streets of Chinatown you can’t help but virtually trip over ornate temples. Whether they are peeping from courtyards or standing bolshie and brash on the street corner. 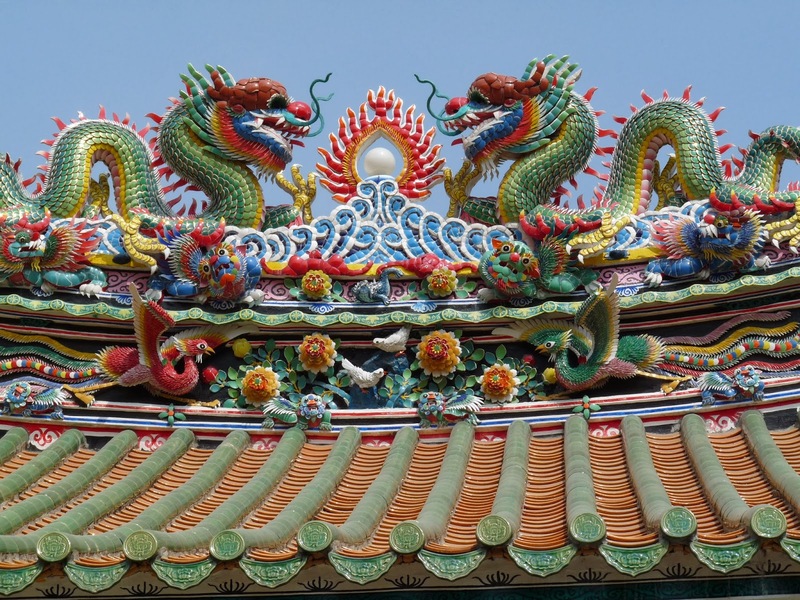 Chinese temples host a wealth of decorative flourishes, from the detailed painting on the entrance gates to the exquisite, fantastical roof tableaux with dragons, flowers, waves and overwhelming colours. 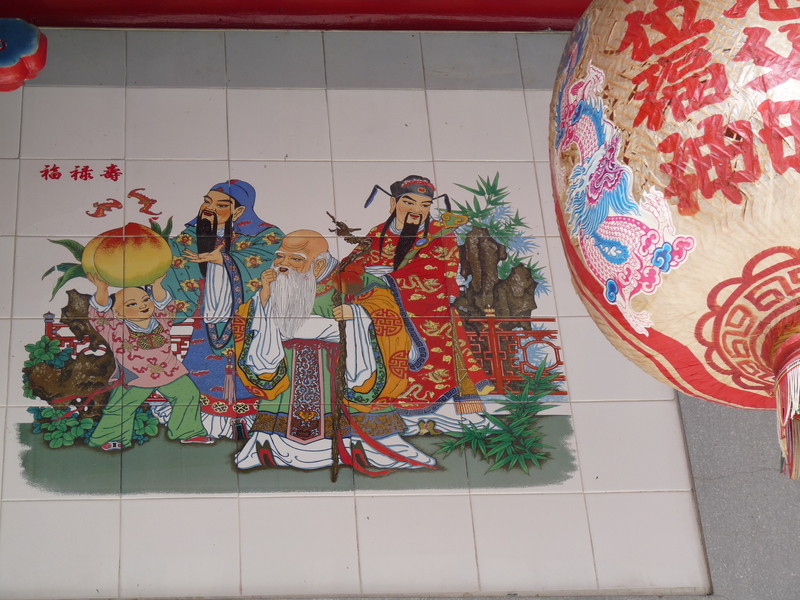 Every inch of these places of contemplation is smothered in colourful, meaningful decoration. 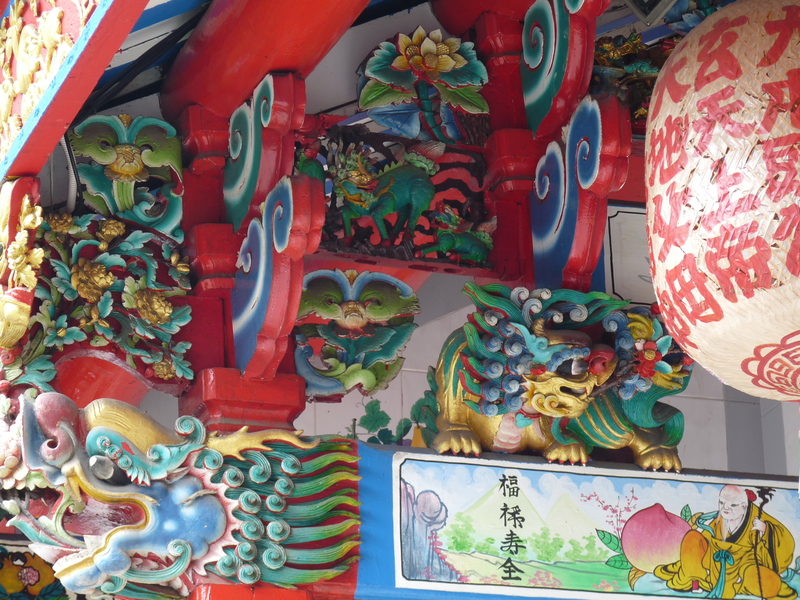 Huge demon warriors watch over the faithful as well as glaring at snap happy tourists. Temples are always some of my favourite photo opportunities.